In Alsace you will meet unmatched serenity, beauty, hospitality and, not the least, some of the World's best white wines. Alsace-Wine.net is your guide to wine touring in Alsace by foot, by bike and by car. Enjoy reading about the great Alsace grape varieties Riesling, Gewurztraminer, Pinot Gris and Muscat, as well as Sylvaner, Auxerrois and Klevener d'Heiligenstein. Learn more about the Alsace Grand Cru system, AOC rules, viticulture and the terroirs of Alsace. Alsace-Wine.net presents several dozens of Alsace producers, many of which are up-and-coming, who all will love to welcome you on their premises. The English version of my Guide to Alsace Wines was publsihed in 2016. The Swedish edition has sold over 2000 copies, and it has been selected as the best book in its category by the Swedish Gastronomic Academy. 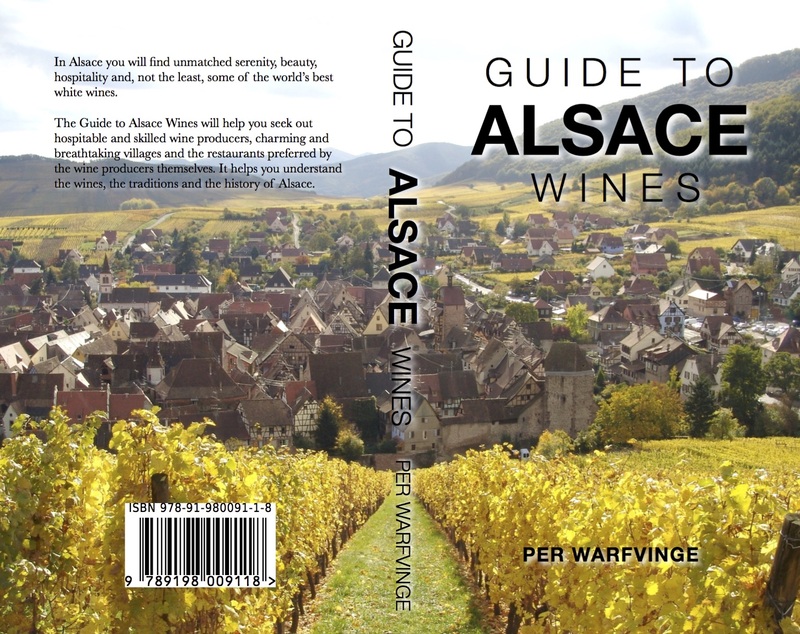 Guide to Alsace Wines presents the region, producers and villages in Alsace in a compact and informed way. It is constantly updated. Click here to place your order!. Click here to read a sample. The growing season 2017 was extremely irregular. The cultivars went into the year with low water reservoirs, and warmth in March boosted the growths. However, in early May, icy winds swept down into the valleys with severe frost damage as a result, especially on Gewurztraminer. To make things worse, hail came soon afterwards. Fortunately, the flowering was very good, even though it was unusually early. The summer was not extremely hot, but dry. 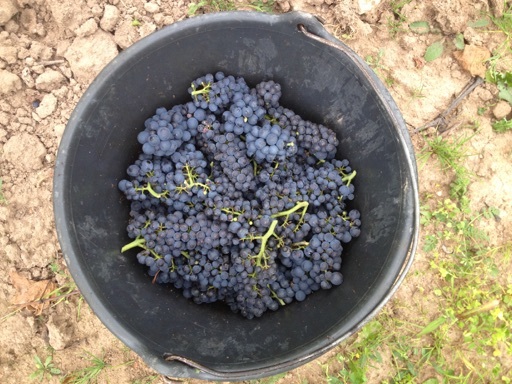 Terroroirs on granite with predominantly Riesling lacked water, but all Pinot grapes are very promising. The harvest has started with stable but cool weather. The wines will be as full as the 2015 but with significantly better acidity. The producers are very optimistic, despite the loss of volume. 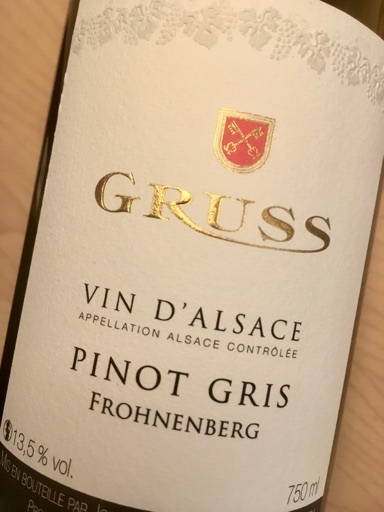 2015 Pinot Gris Frohenenberg, Gruss There is a trend to make completely dry Pinot Gris, entirely from Grands Crus and preferably with some elevage in fat vats. However, while these wines are interesting and complex, it may be nice to go back to basics and drink a classic, semi-dry Pinot Gris of high quality. If you choose a wine from an extremely serious one - do I dare say pedantic? - producer and a cool location, it can not go wrong. 2016 Côte d'Ammerschwihr, Maurice Schoech (Ammerschwihr) for €6.50. 2015 Sylvaner, Bernhard (Katzenthal) for €5.50. 2014 Pinot Blanc, Agapé (Riquewihr) for €7.40. 2014 Gewurztraminer Les Roches, Gruss (Eguisheim) for €10.20. 2014 Pinot Gris Vieilles Vignes, Bruno Sorg (Eguisheim) for €10. If you want a charming appartment, perfectly located in Riquewihr with a private courtyard: Gite l'Oriel. If you want to stay in a small village with a wine growing family, in the heart of alsace: Domaine Jean-Marc Bernhard.